Copper has been in use by civilization since time immemorial and it is being recycled from ages. This non ferrous metal is the best conductor of electricity, second only to silver. Known for its high ductility and malleability and its conductive properties, copper is one of the most sought after metals. Collecting copper scrap is the first step. 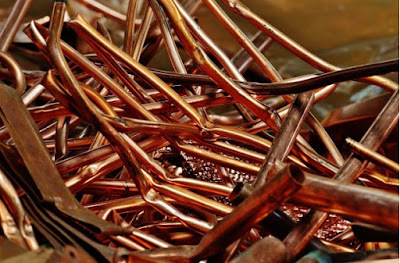 Copper has been the primary component in electrical wiring. It is a good conductor of electricity and is present in cooking devices, air conditioners, electrical cables, heaters, appliances and furnaces. In a large automobile, as much as 100 pounds of copper can be found in its various components. It is also largely found in electronic devices. When you consider that a computer contains a one and a half kilogram of copper, it is easy to imagine the fortune of materials inside the devices that are thrown away. The next step is to reclaim copper from the copper scrap. The main machines used for recycling copper are copper peeling machines, stripping machine and granulators. For a single wire, copper stripping machine can be used. For wires with multiple strands and complicated knots, the copper granulator is used. When the copper scrap is processed by copper granulator, peelers or strippers, the pure copper is separated and transported for further processing. In case of using the wire stripping machine, it is not very convenient to transport the entire copper wire to the melting device and hence it is shredded further. At the smelter, the bales are fed into a furnace and heated until they become molten copper. The molten copper can then be poured into casters and moulds. Once the molten copper has cooled and hardened, they are rolled out into sheets which form the basis of new materials.